"How many quality Iria sites are there on the net? Probably none that meet the quality of Zeiram Dot Com. 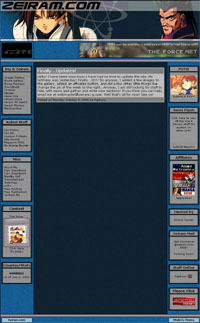 The layout is easy to use and there is a ton of things to see and download. The image gallery is unsorted, but the file names are descriptive enough to figure out the pictures. Boy, are there some nice shots or Iria. There are even tracks from the soundtrack you can download and a lot more stuff I don't have room to write about." "You pulled me way from my HTML coding for THIS?! Heheh... Just kidding. Well, what can I say that everyone else hasn't? They've got everything a respectable fan site needs, and much more. The layout's a nice clean job, and even though they have some sponsor advertising, it's very unintrusive and doesn't bother me one bit. The whole thing's nice and simple -- "Simple is beautiful!" So, yeah, I'd say they do the zeiram.com domain name justice. A class act all the way!" "Very nice! The layout is simple, but clean and attractive. The immense content of the page surely leaves alot for a visitor to toy with, as well as enjoy with the all the various forms of multimedia. Pics, music, and even cosplay! This site definitely has a lil' bit of everything to fulfill an Otaku's need for Iria!" "Excellent quality indeed. This site has just about everything. The layout is definitely eye catching, and professional. The image gallery set up looks out of place compared to the rest of the page, but then again there are a lot of pictures. There are still a few broken links, but I'm sure they will be fixed in time...I am anxiously awaiting the Custom T-shirts."